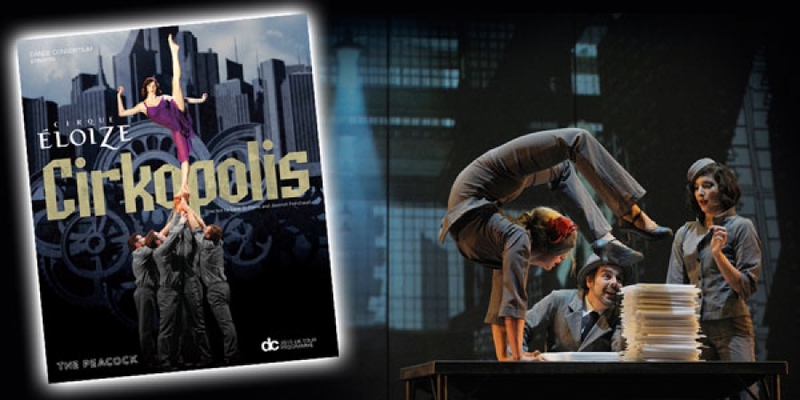 Dance Consortium's presentation of Cirque Eloize's Cirkopolis, directed by Dave St-Pierre and Jeannot Painchaud, currently at the Peacock Theatre in London is quite simply...amazing. The cobwebs of childhood visits to a dusty, smelly circus tent in a cold field were well and truly blown away by this astonishing fusion of circus, music, dance and theatre from Quebec. You are taken on a journey through the mystical city of Cirkopolis with the help of a beautifully designed video backdrop that is as impressive as the performances on the stage. This is pure theatre at its absolute best, with passion, flair, comedy, romance, beauty, power, strength and just a touch of menace. It is difficult to highlight any one performer, they were all incredible, however I caught myself holding my breath at the pure talent and emotion shown through Léa Toran Jenner's solo performance with the Cyr Wheel. Other highlights were contortionist, Maria Combarros who rightly received huge adulation from the audience, the guys on the German Wheel whose core strength shamed me into thinking of renewing my gym membership, Jerome Sordillon on the straps, and the breath-taking performances of the artistes on the Chinese pole. The whole thing was held together by a great modern interpretation of the Circus Clown by Ashley Carr whose routine wooing a dress hanging on a rail was charming and very funny. The companies standing ovation was truly deserved. This show will live long in my memory for all the right reasons. The show is on at the Peacock Theatre in London until Saturday 28th February and then on tour to Canterbury, Southampton, Bradford, Birmingham, Edinburgh and Cardiff until April 2015. I urge you to cross hot coals or walk the high wire to get tickets!